Classy Cookin' With Chef Stef | Laugh, Love, Cook. Yes, if you are a vegetarian, you too can meal prep! It’s not just for meat eaters and gym junkies 🙂 AND, the best part is, if you’re NOT a vegetarian, you can also make this meal prep! You don’t have to eat meat 3 times a day, guys. So you probably hear about this meal prepping thing all the time, but if you’ve never tried it, it can sound intimidating. This video is to help you learn the basics. You can make 7 full meals, for $3.50 each, in less than an hour! It saves you time, money and DEFINITELY helps you stay on track with your fitness or health goals. It’s simple to bring one to work, to the gym, on the go, or wherever you need it! You all know how much I LOVE making one pot meals! I’m all about ease in the kitchen… which includes ease in the clean up! I saw the Buzzfeed version a few months ago and couldn’t believe how many extra bowls and things they used, but still called it one pot. It also looked very time consuming because they would cook the noodles, take out of the pot, cook the egg, take out of the pot, cook the chicken, take out of the pot. You get the idea. Not to mention they used weird ingredients like sriracha and shallots! So, I was determined to make my own, REAL one pot pad thai! I made the traditional version with shrimp and tofu. AND IT IS FREAKING DELICIOUS! Let me know if you try it!! ONE POT PAD THAI VIDEO TUTORIAL! Dice the bottom part (the white part) of the scallion and the tofu. I found that using extra firm worked better. (You can leave it out if you don’t like tofu. It just blends right in, can’t even taste it. Good source of extra protein.) Heat sesame oil in a pot and saute the tofu, scallions and crushed garlic. After about 2 minutes, push those ingredients to the side and add the egg. Let that cook for a minute and then using your spatula, scramble it around. After it’s cooked, mix the egg in with everything else already in the pot. Add the soy sauce, fish sauce, sesame oil and coconut sugar to the pot. Stir everything together. (No need to stir them together before adding to the pot. Save a bowl!) We used coconut sugar because it is unrefined, low glycemic and healthier for you than plain old white sugar. Add the noodles and water. (Yes, the noodles will be sitting there in no liquid. Trust the process 😉 ) Cover with the lid and put the flame on high. After about a minute, the noodles will start to get softer and you can gently push them down into the water. Cover again. The water will start to boil and then you will be able to stir the noodles together with the other ingredients. While you wait for that, prepare your toppings. Dice the cilantro, chop the peanuts, slice open the lime (or lemon) and dice the top part of the scallions. Once the water has been totally absorbed, your meal is ready! Plate it up and add the toppings! Should only take about 8-9 minutes from the time you put the raw noodles into the pot for it to be done. Please let us know if you try it!!! Did you watch our video? What do you think… easier than Buzzfeed?! Another Chef Stef adventure in Australia! Adam and I were going to hang out with our friend Chad and his lovely girlfriend, Elise, in New South Wales, Australia. We decided to spontaneously make a video! He hadn’t made his cob loaf spinach dip yet, so I said… quick! Turn on the camera! We had a blast. It was seriously creamy and delicious. Such a simple appetizer to make. Everyone will love it! Click here to watch the video of Chad showing us how to make it here! Saute the onions and thaw the spinach. Dice the tomatoes and place in a bowl. Add the sour cream, cream cheese, and spinach. Begin to mix and add in the French onion soup mix packet. Hollow out the bread bowl. Put the mixture in. Cook at 375 F for about 20 minutes until light golden brown. Use the hollowed out bread to dip! MMM so delicious. The 4 of us finished it off quicker than we’d probably like to admit. Let Chad and I know if you make it! Have a very HAPPY NEW YEAR! Guilt free caramel apple bread pudding for dessert this Thanksgiving? Ummm, yes please! 1. To make the caramel, add the coconut milk and coconut sugar to a small saucepan. Stir and once it boils, stir again and lower to a simmer. 2. In a bowl, beat the eggs. Add the coconut milk and beat together. 3. Add the cinnamon, sea salt and vanilla extract. 4. Next core the apple, peel off the skin and slice into tiny pieces. 5. Add the apples to the egg mixture and make sure they are well coated. 6. Rip up the bread and continue to mix in until all of the liquid has been absorbed. 7. Grease a pan or a stone that has edges with coconut oil. 8. Add the bread pudding and spread it out evenly. 9. Drizzle half of the caramel on top and use a fork to help it seep through. 10. Bake at 350 for 30 minutes. 11. Once it comes out, let it rest while you stir the remaining caramel. Once you serve it, drizzle that delicious, warm caramel on top! You can even add some ice cream or whipped cream! Mmm. 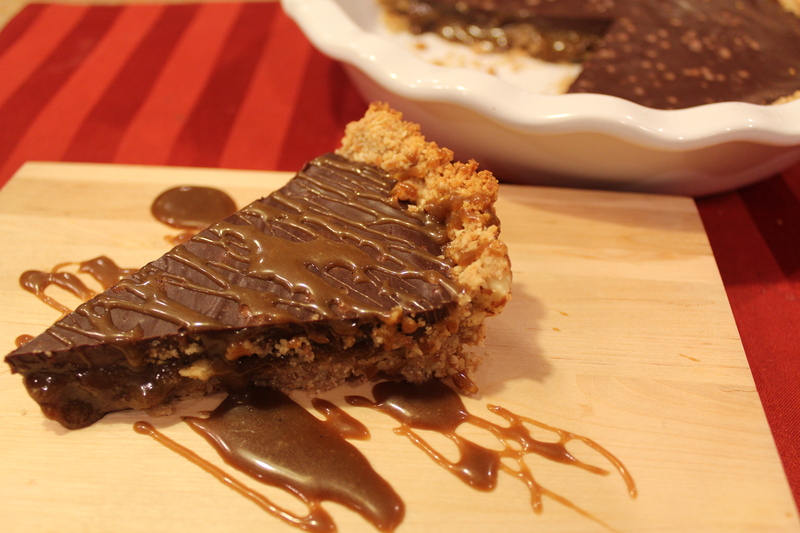 How could it be that this delicious, sea salt caramel chocolate tart is GUILT FREE?!?!? 1. Add the coconut milk and coconut palm sugar to a pot. Stir together and bring to a boil. Make sure you watch it so it doesn’t boil over!! Stir again and then let it simmer for about 45 minutes. 2. Now let’s work on the crust. Beat one egg and mix in the almond flour. You can save money and make your own by grinding up whole almonds. Add the coconut oil and the sea salt, then mix together until well combined. Press into a pie dish or any round baking dish you have. 3. Remember to stir your caramel every once in a while! 4. Bake at 400 degrees for 15 minutes. Once it comes out, let it cool for 10 minutes before you pour in about one cup of caramel. Place in your fridge for as little as 30 minutes – or can also do overnight! 5. When that’s ready, you can start working on the chocolate ganache part. Melt the coconut milk, If you don’t have a double boiler, you can do a makeshift one like I did! Add in the chocolate and stir. It will only take less than a minute to melt and turn into the ganache so don’t walk away from it. 6. Take the dish out of the fridge and then pour the chocolate on top. Spread it around to make an even layer. Place back in your fridge until the chocolate is hardened and you’re ready to serve! The easiest way to cut through the chocolate on this bad boy is by running your knife under hot water first, wipe off the water, then slice. Easy as pie! Ha! Get it? Enjoy!!! PLEASE let me know if you try it out!! Send me a pic to one of my social medias!! The BEST Healthy Pasta Casserole! This was supposed to be my birthday lasagna… and it turned into an amazing birthday pasta casserole because all 3 of my grocery stores didn’t have brown rice lasagna noodles! (Gluten free) This is a great, simple dish to prepare for a large group, or, great for meal prep! You can totally put this in the freezer in individual servings. Great for gluten free or vegetarian guests! A healthier version of lasagna for sure. Feel free to substitute the pasta for lasagna! I made it in layers so it can easily be switched! For 12-16 servings, you’ll need these ingredients. Feel free to chop them in half! Put a large pot of water up to boil for pasta. In another pan, heat up the olive oil and saute the spinach. Once it has cooked down, you need to drain the liquid. Put the spinach in a colander and use a spatula to squeeze it out. In a bowl, beat an egg, add the ricotta cheese and mix together. Add the spinach, salt and pepper, and mix until all ingredients are well combined. When your water boils, add the pasta and cook al dente. Cut up the opinions, add olive oil and saute in the same skillet you used to cook the spinach. Slice your zucchini thin and saute with the onions. When your pasta is al dente, drain it and put back in the pot. Make sure to add a bit of olive oil so it doesn’t stick together. Now we build. First layer is 1/3 of the pasta, next is the sauce, fresh basil, half of the ricotta mixture, 1/3 of the shredded mozzarella, and half of the zucchini. 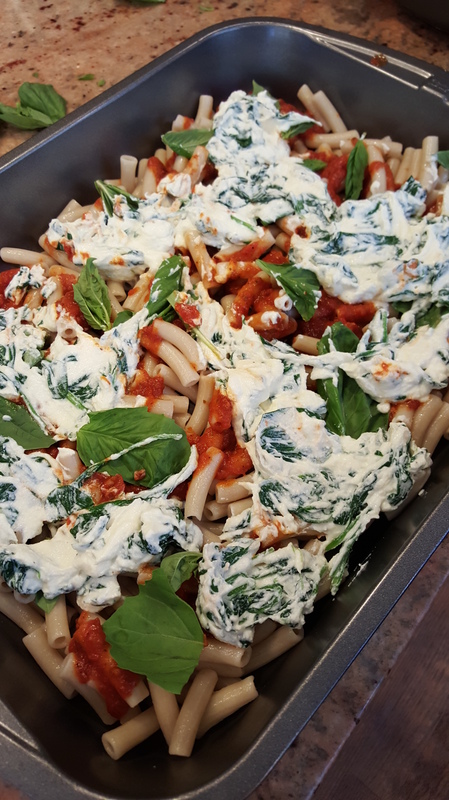 Then another layer of pasta, sauce, basil, the rest of the ricotta, 1/3 of the mozzarella, and the rest of the zucchini. Top it off with pasta, sauce and the rest of the mozz. Add some fresh black pepper to the top and cover the tray with tin foil. Place in a 350 degree oven for 20 minutes. When the timer goes off, take the tin foil off and bake for another 10 minutes. Then, put the broiler on high to get the cheese toasty, leaving the oven open a bit so you can watch it. It will only take a minute or two. Once it comes out, let it sit for a few minutes before cutting. BOOM! Everyone will love it!! Let me know how it comes out and if you made any substitutions!